To evaluate the changes in productivity when scribes were used by emergency physicians in emergency departments in Australia and assess the effect of scribes on throughput. Five emergency departments in Victoria used Australian trained scribes during their respective trial periods. Sites were broadly representative of Australian emergency departments: public (urban, tertiary, regional referral, paediatric) and private, not for profit. 88 physicians who were permanent, salaried employees working more than one shift a week and were either emergency consultants or senior registrars in their final year of training; 12 scribes trained at one site and rotated to each study site. Physicians worked their routine shifts and were randomly allocated a scribe for the duration of their shift. Each site required a minimum of 100 scribed and non-scribed shifts, from November 2015 to January 2018. Physicians’ productivity (total patients, primary patients); patient throughput (door-to-doctor time, length of stay); physicians’ productivity in emergency department regions. Self reported harms of scribes were analysed, and a cost-benefit analysis was done. Data were collected from 589 scribed shifts (5098 patients) and 3296 non-scribed shifts (23 838 patients). Scribes increased physicians’ productivity from 1.13 (95% confidence interval 1.11 to 1.17) to 1.31 (1.25 to 1.38) patients per hour per doctor, representing a 15.9% gain. Primary consultations increased from 0.83 (0.81 to 0.85) to 1.04 (0.98 to 1.11) patients per hour per doctor, representing a 25.6% gain. No change was seen in door-to-doctor time. Median length of stay reduced from 192 (interquartile range 108-311) minutes to 173 (96-208) minutes, representing a 19 minute reduction (P<0.001). The greatest gains were achieved by placing scribes with senior doctors at triage, the least by using them in sub-acute/fast track regions. No significant harm involving scribes was reported. The cost-benefit analysis based on productivity and throughput gains showed a favourable financial position with use of scribes. 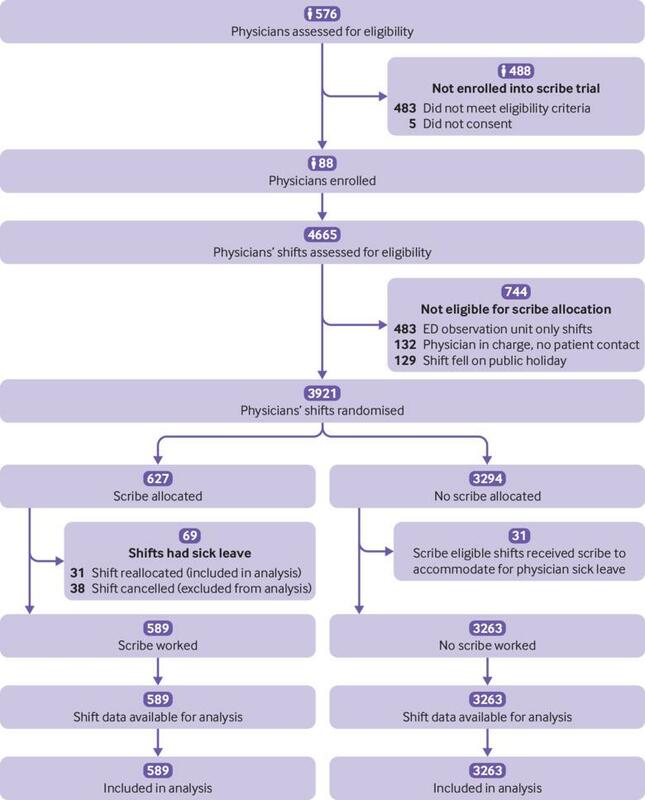 Scribes improved emergency physicians’ productivity, particularly during primary consultations, and decreased patients’ length of stay. Further work should evaluate the role of the scribe in countries with health systems similar to Australia’s.